Myrcharn are are British cavalrymen. They are light cavalry to be used as extremely mobile skirmishers against lighter troops. The Myrcharn (Mur-churn; "Mounted Ones") are British cavalrymen. These cavalry are essentially mounted skirmishers. The Britons are based upon infantry though, and cavalry are secondary. They are light cavalry, and incapable of standing too long in a close melee, though their use as extremely mobile skirmishers is of great value against lighter troops or when one doesn't wish to risk valuable soldiers to soften a heavier armored foe. Against longspears or a phalanx, they will almost surely collapse immediately, and should be kept from engaging such weapons directly, though they can be used to pepper such formations. Historically, the Britons rarely employed mounted cavalry. Chariots, rather antiquated in much of the world, were more favored by the Britons. However, the use of cavalry was still important, though they were more for harassing or scouting operations, and for skirmishing and shock in battle. This allowed them a bit of versatility in mounted combat, but they were still very poorly trained compared to their contemporaries, as horse-mounted cavalry were an afterthought. 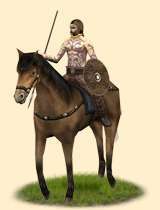 Such cavalry were used to harass Roman incursions, and most likely others travelling through a tribe's lands unwanted.